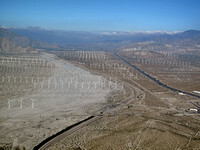 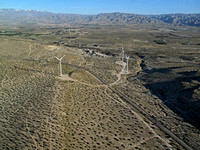 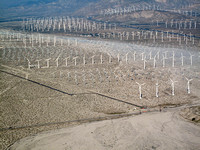 This wind farm on the San Gorgonio Mountain Pass in the San Bernadino Mountains contains more than 4000 separate windmills and provides enough electricity to power Palm Springs and the entire Coachella Valley. 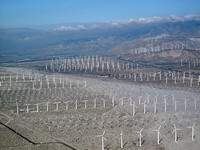 Developed beginning in the 1980s, it is one of three major wind farms in California, along with those at Altamont and the Tehachapi passes. 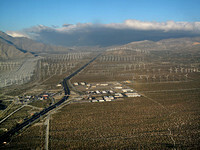 The San Gorgonio Mountain Pass is one of the windiest places in Southern California.